Having a senior dog is awesome. When life gives you awesome, you should make awesome-ade. Um... you should celebrate it, I mean. Celebrate the awesome. I'm a dog person. Most of the people I know and spend time with are dog people. If you are reading this post I assume that you are a dog person. But there are some people in my life, that I love dearly, who do not share my enthusiasm for dogs. And for me, that is 100% okay. I can't make anyone like dogs any more than they can make me like tomatoes or raw oysters. What's important to me is that they accept me completely as I live my largely canine-centered life, even if they don't have the same opinions or beliefs. What can you do, though, when dealing with someone who doesn't seem to respect your dog's place in your life? What do you do when someone doesn't "get it"? A friend of mine recently attended a wedding where one of the readings was about how falling in love is like owning a dog. In addition to making me want to borrow a time machine so that I could go back and include this poem in my own wedding ceremony, it got me thinking about the ways in which senior dogs embody love. The poem in question is "How Falling in Love is like Owning a Dog" by Taylor Mali. With a tip of my metaphorical hat to Mr. Mali, I thought I'd add a few verses of my own specifically about senior dogs. Keeping my dog happy and healthy is a top priority for our family. As he grows in his golden years, his needs have changed and care has taken on new forms. How do we make choices and decisions for his care that are best for him as a senior dog? When I went to nursing school, I learned about the ethical principles that form the backbone of our code of ethics. Applying these principles to Emerson's care has helped me to make choices that are based on love, respect, compassion, and kindness. This one's easy! The principle of beneficence represents compassion, promoting goodness, and taking care of others. This is the main principle I use every day with Emerson. Each day he gets a comfy bed, healthy food, emotional and physical engagement, and all the love we have to give. He also gets medicine to keep his arthritis pain at bay, and he has regular visits to the vet to make sure he’s staying healthy. Muffin was my family’s dog for 15 years. She was a mutt my dad found in his work parking lot, who he fed and eventually brought home. When Muffin started getting older, we had to adapt to her new needs though. Earlier in her life, we used hand signals along with verbal commands for sit, stay and come without really realizing it. But once we realized she was losing her hearing, we relied on those signals. She would watch for our wave to come and a palm faced out to stay. Then, when we realized she was almost deaf, but found out she could hear loud, sharp noises, my mother would bang on a pan with a spoon to get her attention in the yard. Inside, she could still feel vibrations on the floor, so we’d stomp to get her attention. You've probably heard the saying that you can't teach an old dog new tricks. That's just silly. Senior dogs can be star pupils, and they make pretty good teachers too. As you can tell from the scholarly photo above, my senior dog Bella was meant to be a professor. What has she taught me? Guest Post Friday is our series which shares funny pet bloggers, and smart dog lovers, pet industry influencers and animal advocates. With lots of fascinating people involved in making a difference in the lives of animals this is our way of sharing them across the Grouchy Puppy community. Today our friend A.J. from I Still Want More Puppies returns, with a list of comments and questions she hopes never to hear again about her Bella or any senior dog. Her sweet Bella is along for the ride, showing her support with two choice photos. To read more about pup culture and pop culture in A.J. 's tongue-in-cheek style, check out her blog. Her motto may be Puppies = serenity now, but don't let it fool you, she actually likes adopting adult dogs. And while you're at, read her previous post she wrote for us about the many reasons you should adopt an older dog. Chances are that one day you will encounter someone who owns a senior dog (or you have already). You’ll innocently ask the dog’s age. Upon learning that the dog is no longer a spring chicken (or a spring puppy, I suppose), what will you say? Our latest installment is from a passionate pet advocate we met two years ago. I am head of a multi-pet household. I share my home with two cats and three birds. I am never alone. I maintain connections with my parents, siblings, friends, and extended family, but I consider the moments I spend with my pets some of the most important in my day. In times of stress or turmoil, they are there for me. I can’t imagine my life without them. From the early days of human history, animals have had an impact on our lives, but in the 19th century, when we started bringing them into our homes as companions, the relationship began to deepen. Now, the majority of homes in the United States have at least one pet. Those of us who share our lives with animals believe we are the better for it. Modern society is impersonal. We once relied on our neighbors and family connections, but now technology gives us the illusion of greater independence, and fewer meaningful connections as a result. The connections we have are closer to home, centered on family, but families are changing too, becoming geographically scattered. Our families are smaller, family units more fluid. As a result, pets have taken on a larger role in our lives. For many of us, pets are family. It is Guest Post Friday, and this time we have Sonia Singh, a large dog expert who writes the Big Dog Blog at Paw Posse. She shares some valuable tips for making sure your older dog is in tip-top shape throughout their golden years. Just like puppies need special food and health care to nurture their growing bodies, senior dogs need special care too. As they move from adulthood to golden years, their bodies change and so do their needs. Keep these tips in mind to give your dog the care they’ve earned. Before all else, know when your dog is considered a senior. It’s not the same for each dog – it varies based on size. Larger dogs are considered senior earlier than small dogs. The American Animal Hospital Association considers small dogs senior once they hit 10 years old, while a giant breed could be considered senior at just 5 years old. 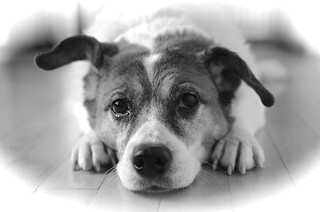 One way to estimate senior age is half of your dog’s life expectancy. Another way is to determine your dog’s relative human age (see chart below) and consider them a senior when they reach 50-55 “human” years. For the best estimate, ask your vet when your dog will reach senior age. How a rambunctious Border Collie becomes a Therapy Dog! Allow me to introduce myself....my name is Rosalynn Lily, I'm a five year old wild and crazy Border Collie. When I was adopted by my fur-mom at 7 weeks old from a local Livermore rancher, she kept saying that she needed to find a job for me as she hadn't been able to do that with her previous border collie. We tried agility when I was old enough but unfortunately, due to an injury I sustained during my training, I never had the opportunity to compete in a single agility competition. That injury also kept me out of other high intensity activities such as flyball or what I was bred for, competive sheep-herding. Another cute pair of dogs making merry at Christmastime. Here are Dexter and Peppermint sharing their example of “giving fearlessly” to us. This is a guest post by Jennifer, an animal lover who has the uncanny ability to meet a dog and remember their name way better than she can remember the human’s name (which has led to some awkward moments at a party or two). Jennifer strives to influence positively each day and make a difference in a dog's life whether it’s by training and spending time with her four-legged family member or walking the dogs at the local animal adoption center. When we saw his picture posted on Petfinder.com, we were instantly drawn to him. And the name “Bear” described him perfectly: he had a thick, fuzzy black coat, big soulful amber-brown eyes (like the color of honey), and an adorable, cuddly pudgy-puppy physique. But the feature we were most drawn to…his ears! With his one ear standing straight up at attention, and the other ear all floppy like a Lab’s, Bear’s mismatched ears only added to his cuteness and barked volumes for his goofy personality. Guest Post Friday is our new series sharing funny pet bloggers, and smart dog lovers, pet industry influencers and animal advocates. With lots of fascinating people involved in making a difference in the lives of animals this is our way of sharing them within the Grouchy Puppy community. Our first guest post is from A.J., a long time friend of Grouchy Puppy and someone we finally got to meet in person at BlogPaws. She shares her reasons behind why all dogs can be puppies and why she loves senior dogs - perfect timing for Less Adoptable Pet Appreciation Week.